Traditionally, the analysis of water systems and the design of infrastructure was the domain of scientists and civil engineers. Setting up a model and making simulations was complex and time consuming. Nowadays, thanks to recent advances in software and hardware, the simulations can be made on the fly. This allows for real time interaction with the simulation model, for instance in an interactive design session. The SandBox is a novel Augmented Reality (AR) modelling tool for designing and co-creating interventions in (coastal) water systems anywhere in the world. The combination of the SandBox and the new Delft3D Flexible Mesh Suite (Delft3D FM) offers a unique 3D interactive modelling solution to shape and visualize the impact of proposed measures in various water systems. The present version of the SandBox consists of a scale model of the Dutch coast and real sand that people can shape into a design – representing a coastal nourishment – with their own hands. Adjustments to the sandy bed are measured in real time and transmitted to a hydraulic coastal model, after which the computed tidal currents and other model parameters are visualised instantly in the box. As such, the SandBox functions both as a physical user interface and as output screen at once. The SandBox has been conceived as a tool for encouraging co-design, a process in which designers and stakeholders can develop a design together and communicate interactively about issues such as design requirements and environmental impacts. Additionally, the SandBox can be used for communication in education and science and for creating flood risks awareness. The technology of the SandBox is based on the LakeViz3D project (http://lakeviz.org), in which the blue print of the AR SandBox and the software were made available publicly. The system relies on a Kinect camera to measure topography and a beamer to project visualisations in the box. 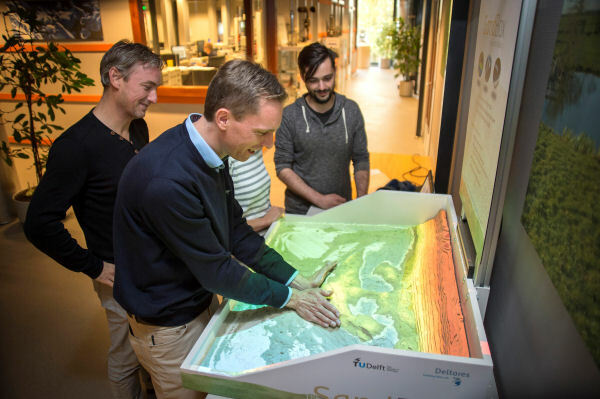 The innovative feature of the Deltares SandBox is the real-time link (open source code) with the Delft3D FM, which allows for interactive model interference. The communication between the SandBox and Delft3D FM is realized through BMI (Basic Model Interface). Interested in using the SandBox to boost your stakeholder participation meetings or achieve more effective communication to the general public? We are open for collaboration in developing the SandBox further for new applications – not restricted to coastal waters. For more information, please contact Cilia Swinkels.